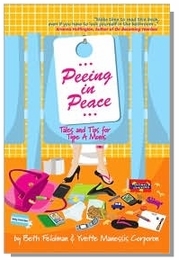 Peeing in Peaceby Beth Feldman - Largest Twin Store & Twin Gift Registry! Are you a multi-tasking mom pulled in a million directions by your precocious kids, demanding boss and starved-for-attention spouse? Do you find the only time you're able to steal a moment to yourself is behind the doors of a bathroom stall? If so, then you are in desperate need of a playdate with Peeing in Peace. Honest and unafraid to talk about working motherhood's dirty secrets, such as bribing, potty (mouth) training, and going to the office to relax, working moms Beth Feldman and Yvette Manessis Corporon offer community, chuckles, and co-conspirators for busy moms everywhere. Packed with stories, tips, and even a recipe or two, Peeing in Peace will help you navigate the choppy waters of work, home, and the chaos in between. So grab a latte, enjoy the quiet, and dive in! "A must-read for any mom who needs a little boost while trying to juggle business and babies."